Ask if the customer requests I/M examination. Malfunction information, obtained>>GO TO 2. No malfunction information, but a request for I/M examination>>GO TO 13. Perform the following procedure if DTC is displayed. Erase only DTC of “ENGINE”. Are any symptoms described and any DTCs detected? Symptom is described, DTC is detected>>GO TO 3. Try to confirm the symptom described by the customer (except MIL ON). Also study the normal operation and fail-safe related to the symptom. Refer to EC-492, "Description" and EC- 89, "Fail Safe". Diagnosis Work Sheet is useful to verify the incident. Also study the normal operation and fail-safe related to the symptom. Refer to Refer to EC-492, "Description" and EC-89, "Fail Safe". Perform DTC CONFIRMATION PROCEDURE for the displayed DTC, and then check that DTC is detected again. If two or more DTCs are detected, refer to EC-92, "DTC Inspection Priority Chart" and determine trouble diagnosis order. Is DTC detected? YES >> GO TO 10. NO >> Check according to GI-41, "Intermittent Incident". Do you have CONSULT? YES >> GO TO 7. NO >> GO TO 9. Check that “MASS AIR FLOW SENSOR (Hz)”, “B/FUEL SCHDL”, and “A/F ALPHA-B1” are within the SP value using “SPEC” in “DATA MONITOR” mode with CONSULT. Refer to EC-157, "Component Function Check". Is the measurement value within the SP value? YES >> GO TO 9. NO >> GO TO 8. Detect malfunctioning part according to EC-158, "Diagnosis Procedure". Is a malfunctioning part detected? YES >> GO TO 11. Detect malfunctioning system according to EC-486, "Symptom Table" based on the confirmed symptom in step 4, and determine the trouble diagnosis order based on possible causes and symptoms. NOTE: The Diagnosis Procedure in EC section described based on open circuit inspection. A short circuit inspection is also required for the circuit check in the Diagnosis Procedure. For details, refer to GI-44, "Circuit Inspection". Is a malfunctioning part detected? YES >> GO TO 11. NO >> Monitor input data from related sensors or check voltage of related ECM terminals using CONSULT. Refer to EC-77, "Reference Value". Check DTC. If DTC is displayed, erase it. 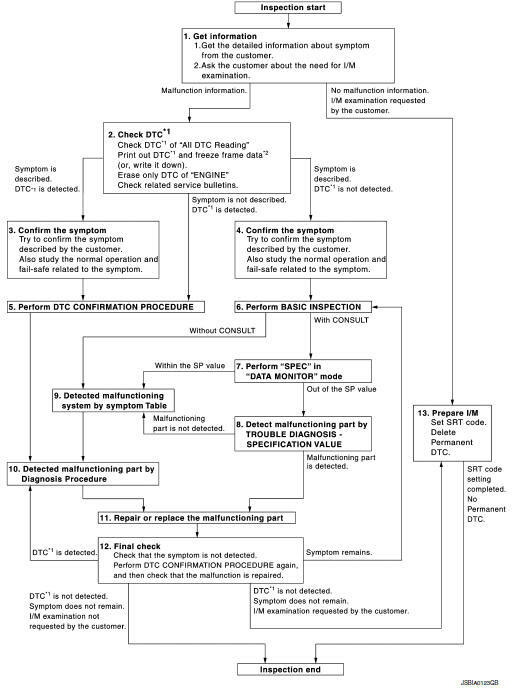 When DTC was detected in step 2, perform DTC CONFIRMATION PROCEDURE or Component Function Check again, and then check that the malfunction have been completely repaired. When symptom was described from the customer, refer to confirmed symptom in step 3 or 4, and check that the symptom is not detected. Is DTC detected and does symptom remain? YES-1 >> DTC is detected: GO TO 10. YES-2 >> Symptom remains: GO TO 6. NO-1 >> No request for I/M examination from the customer: Before returning the vehicle to the customer, always erase unnecessary DTC in ECM. If the completion of SRT is needed, drive vehicle under the specific driving pattern. Refer to EC-146, "SRT Set Driving Pattern". NO-2 >> I/M examination, requested from the customer: GO TO 13. Set SRT codes. Refer to EC-145, "Description". Erase permanent DTCs. Refer to EC-151, "Description". There are many operating conditions that lead to the malfunction of engine components. A good grasp of such conditions can make troubleshooting faster and more accurate. In general, each customer feels differently about symptoms. It is important to fully understand the symptoms or conditions for a customer complaint. Utilize a diagnostic worksheet like the WORKSHEET SAMPLE below in order to organize all the information for troubleshooting. Vehicle ran out of fuel, which caused the engine to misfire. Fuel filler cap was left off or incorrectly screwed on, allowing fuel to evaporate into the atmosphere.